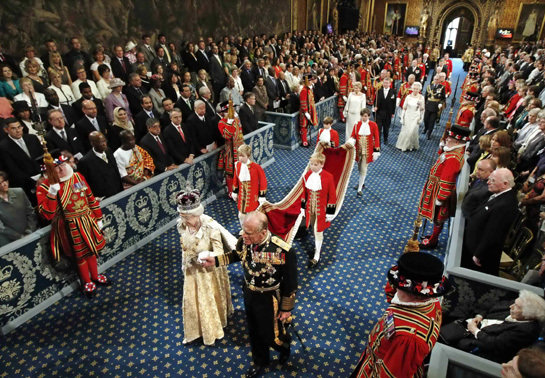 Wednesday saw the annual State Opening of Parliament centred around the Queens Speech. It is perhaps the key moment for the Queen in political life and in it she explains of the coming policies and proposed laws for the future year in a similar way to the State of the Union speech in the United States. However this being Great Britain, the whole thing mixes modern day events with centuries of spectacular though often curious traditions. These days many people think the Queen is just a figurehead and has no real power. In many ways they are right but she does still have some powerful rights, it is just that she chooses not to exercise them and some haven’t been actioned for centuries. It wasn’t always the case though. Often historical kings and queens are seen as all powerful, in reality they were just the most powerful amongst many other powerful groups and from achievements such as the Magna Carta (which I will write about in June) and rebellions by brave or principled people such as Simon De Montfort, there was a steady erosion of power away from the monarch towards Parliament. The monarchs often resented this hugely and still believed that they ruled in the name of God and could do whatever they desired. They often only held Parliament infrequently and often then it was only because the King wanted something from his lords, usually money for wars. Things reached a critical point with King Charles I who tried to rule without Parliament for many years after it stood up to him too many times. Eventually he had to assemble his barons when he became bankrupt. These events are just part of the lead up to the English Civil War, the beheading of King Charles I and the creation of a republic in England. It was all a bit too early for democracy and it was over a century later when these parliamentarians inspired both the American and French revolutions and the concept of equality and freedom. So King Charles II later became king and he and his successors agreed to reduced powers and in 1701 the Act of Settlement enshrined the primacy of parliament over the monarchy. However, only the Queen can open and close Parliament and the ceremony has lots of historical elements. 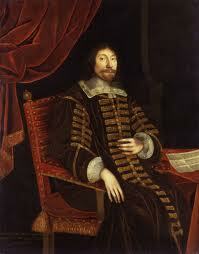 Parliament is searched to ensure that there are no possibilities of a repeat of the gunpowder plot. An important figure from Parliament goes to Buckingham Palace and is held hostage. This goes back to the times when such events where necessary for the safety of the Monarch when going to Parliament. 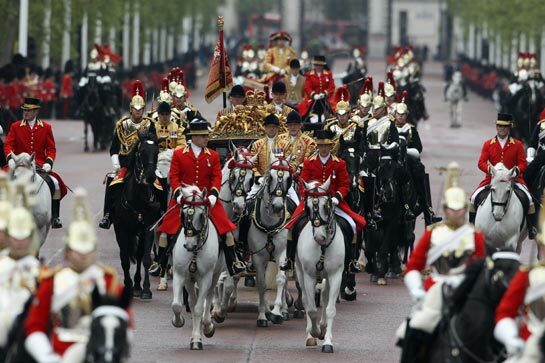 The Queen and Prince Philip journey to parliament in horse-drawn procession with soldiers from her Household Cavalry amongst others. The Imperial Crown is also brought to Parliament separately by a similar carriage as one of signs of ultimate power in the country. The Houses of Parliament were designed so that if one stands in the middle of the corridor you can see the Queens throne at one end of the House of Lords building and the Speakers Chair at the far end of the House of Commons. When the Queen arrives, an official known as Black Rod will walk down the corridor from the House of Lords to the Lower House or House of Commons. As he arrives, the door will be slammed shut, this is to signify that the House of Commons is independent and that the Queen cannot enter and issue commands as she pleases as King Charles I and his predecessors tried to do. 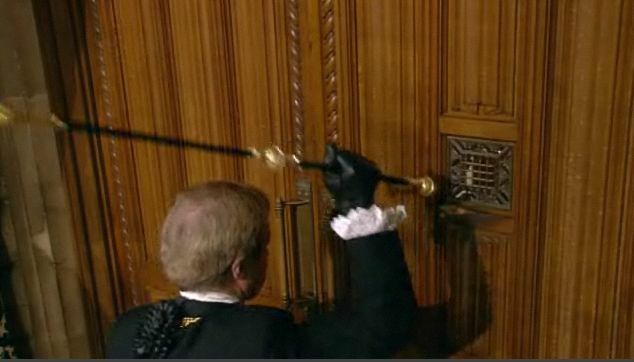 Black Rod will then hammer on the door with his cane 3 times after which he will be let in. He will then proclaim a summons for the MPs to come and listen to the Queens address. 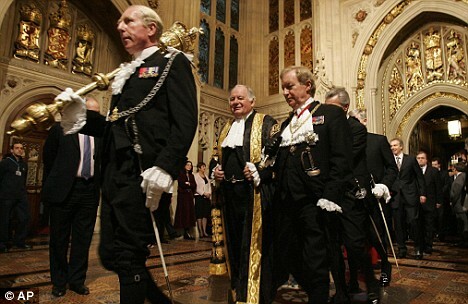 Black Rod or these days often another official will then carry the Mace from the Commons to the House of Lords. The MPs will follow in pairs, often joking with each other and deliberately taking a long time so as to go back to the days when parliamentarians would have to demonstrate they weren’t at the beck and call of the monarch. 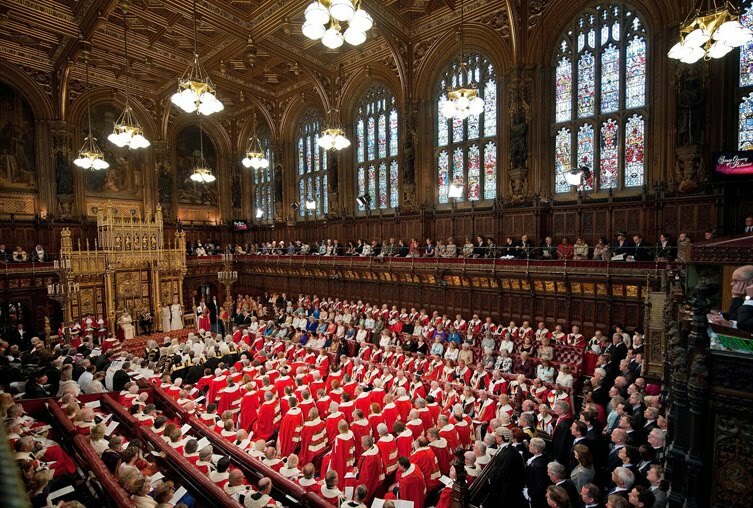 Not many MPs get to see what is going on as generally MPs are not allowed far into the House of Lords just as Lords are not allowed far into the Commons. Once everyone is at their places, the Queen will be given the text to read out setting out the plans for Parliament in the coming year. These will be based on texts planned out by the government and not herself. It is now that things appear most spectacular and in many ways medieval. The MPs will be dressed in formal suits but everyone else will be wearing ceremonial uniforms, hats, white wigs, swords and symbols of power. Whilst the Lords is full of gold and regal reds, the Commons is “simple” in its decoration, at least in comparison. Once the speech has been read out, the Queen will leave the chamber, accompanied by Prince Philip and after a short discussion with senior officials will depart Parliament in one of the many stately carriages at her disposal. The MPs and others will then be told that the Queen has completed her reading and that their presence is no longer required. The Mace and the Speaker of the Commons will then lead the MPs back down the corridor to the Commons where they will bow before the chair and the ceremonial instruments of power will be put in their place and parliamentary business in both houses can take place. As well as opening and closing Parliament, the current Queen has other unique powers. She can still overturn any proposed law and indeed like her predecessors, signs into statute any and all laws. She can also veto the appointment of any member to the House of Lords, our Upper House. The Prime Minister of the U.K. meets with the Queen weekly and as these meetings are private it is often a useful place for the Prime Minister to discuss problems and the current situation with someone above politics. After over 60 years as Queen, Her Majesty obviously has lots of experience that most other politicians or heads of state can only dream of. 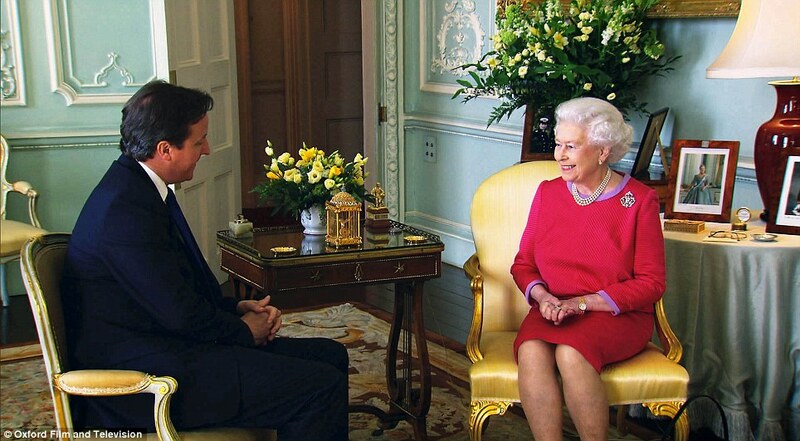 The Queen hosting her weekly talks with the Prime Minister, David Cameron MP. Amongst lots of other smaller things, the Queen is Commander in Chief of the military, head of the Church, represents the U.K. in some international functions, calls for General Elections and can choose the Prime Minister although by tradition she always picks the leader of the most popular political party. Other institutions are run in her name such as HM Prisons or the Royal Mail. 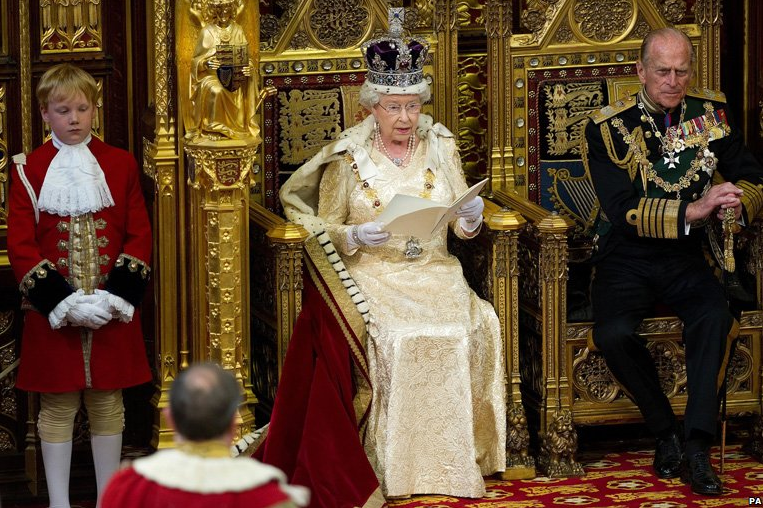 The Queen reads the proposed laws and initiatives which her government will enact. Some people might think this is a little strange but for the most part the British are happy and proud of the Queen. She takes a kind of motherly role over the nation and what is lost by the idea of having a monarch is usually thought to be made up for by having a head of state which is above political infighting, interest groups and bribery. It’s a muddle but then as we don’t have a written constitution but instead one based on centuries of precedents and judicial judgements it is something we are used and happy to live with. 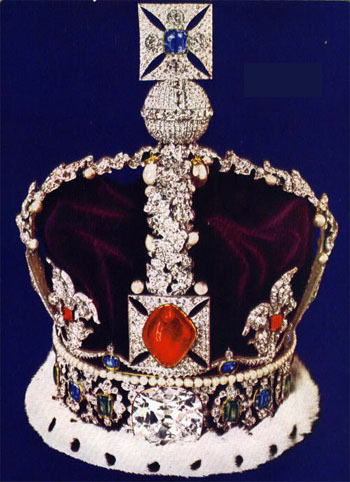 The Queen has several bejewelled head-wear but the imperial crown is only worn on certain state occasions. This entry was posted in history, London, Politics and tagged Culture, government, history, Life, News, Parliament, Politics, royalty, tradition. Bookmark the permalink. That’s a great post Stephen and a very good reason for continuing with the monarchy rather than having an elected head of state and a republic. I have no strong views about the monarchy but I think you have a painted a powerful case there for retaining it. Odd we write about the same topics from time to time. I too wrote about the Queen’s speech – totally different perspective however. Thank-you and also to linking to it from your own post. I am relatively neutral also on the monarchy but really only neutral in theory only as I find almost the entire bunch of UK, European and American politicians to be either woefully inadequate or in the pockets of interest and money groups whether legal or not just doesn’t ring right to me. The thought of having a President in such a situation doesn’t bear thinking of to me. Yes it is strange how we write about the same topics from time to time. There are one or two others I notice that with too. Maybe great minds think a like 🙂 I must admit I have been a bit behind with blogging and reading this last week and this event got me back into the swing of things. Stephen, I am an American who has just been to England and Scotland and loved it all. We especially enjoyed Oxford, York and the country-side. I find the traditions that you still keep in such a long history fascinating. Your post shed some light on things that I did not know…such as the carrying of the crown and the symbolic jesters of pounding on the door etc. We in American have customs that vary from state to state, but overall our traditions nationally are lacking. I think this is because we are immigrants from all over the world. We like to think of ourselves as the “United” States….but more often we are split. You should be proud of what you have been able to keep as your government and monarch sit side by side. As you pointed out, it has been difficult through the centuries. I’m really glad that you enjoyed my article so much Nancy. I know that in the 19th Century there was quite a republican movement here but I can’t see the monarchy going anything at least for the 21st Century. It just seems to work so well. The Prime Minister and his colleagues and opponents battle it out for day to day control and policies and all the while the monarch is so far above them and neutral so they do not get tainted by politics and as such “loved” or supported by more of the population than any president could be. Quite a few people here do think we should have an annual televised address as the President of the USA does which tries to be addressed to the whole nation but to a degree the Prime Minister is held to account every week in the televised Parliament and The Queen does address the nation at least once a year at Christmas but as she is non-political, her address is entirely non-political too. Many of these traditions appear archaic and silly, but they serve as a reminder of how we have progressed. Some aspects, like the taking of a “hostage” illustrate the essentially fragile nature of democracy. We would do well to reflect on this and realise how fortunate we are. We are fortunate also that the Queen has never been placed in a position where she has had to consider over-ruling the government. This could happen though. It would be interesting to know if the Queen or her immediate predecessors ever came close to exercising their authority in times such as the 70’s or mid 80’s. I found this fascinating…have a look, it’s well worth the read. Well written and full of very useful information!